I’ve noticed a re surge of the one pan dinner lately. Love the idea! Great for weeknight and a bit healther than the Hamburger Helper I remember as a child…but boy, did I love the Cheeseburger version! I love the idea of everything in one pan and bam, your dinner is done! 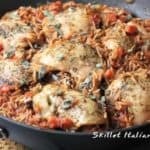 What I don’t like is when the recipe asks you to cook the pasta, rice, chicken or other ingredients in a separate pan and then add them to the skillet. Wouldnt’ that make it a 2 Skillet dinner? 1.) Must be able to cook entire recipe in one pan. 2.) Must include chicken (cause that’s what I had in my fridge). 3.) Must be able to use ingredients that are easy to obtain and usually on hand. I dug into my plethora of recipe sights, blogs and even my old Time Life Magazine cookbooks but came up empty handed. What to do? I know! 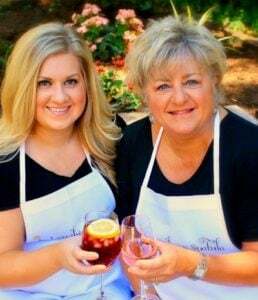 I’ll pour some wine and ponder…something wonderful always happens when I ponder and drink red wine. It’s my go too problem solver! At last, I found an old issue of Cooks Country magazine and there, it was. Not only did it fit all my criteria, it was Italian! If you follow this blog, you know I’m a sucker for all Italian food. An easy to make skillet dish that your whole family will love! 1 1/2 pounds of boneless chicken thighs or breasts -about 6 thighs or 4 breasts. I used thighs for this recipe but either will work. Pat chicken dry and rub with oregano, pepper flakes, sprinkle of salt and pepper. Set aside. Heat large nonstick skillet on medium high heat and toast orzo until lightly browned; transfer to bowl. Add garlic 1 tablespoon oil to empty skillet and cook until fragrant, about 30 seconds. Add tomatoes, broth and toasted orzo and bring to boil. 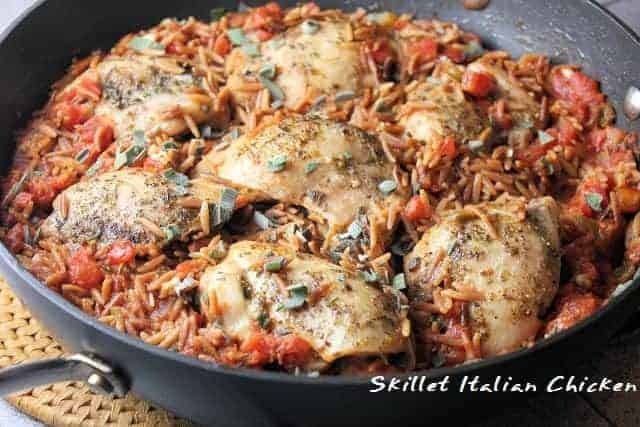 Return chicken, along with any accumulated juices, to skillet and cook, covered, over medium low heat until chicken is cooked through and orzo is tender, about 20 minutes. Sprinkle with basil and serve. Hi Theresa, Yes, I’d cut it back to about a 1/3 to 1/2 cup. I’ve made this recipe so many times, finally remembered to come say thank you! My husband would eat this dish 5x a week if I made it that often. Very versatile, can play with the ingredients how you want, but the recipe is perfect in the original form. Thanks for sharing it with is! Thank you Barbara! Oh my gosh that makes me so happy and I truly appreciate you taking the time to send a note! Have a great evening! I have made this a few times now and it always comes out perfect and is husband-approved. My only change is I add in chopped white button mushrooms (after the garlic but before the tomatoes, stock etc). It is my go-to when I feel like comfort food and I almost always have all the ingredients on hand. Love the idea of mushrooms…the more veggies the better! I still make this dish about once a month and we eat it for days. Love the lightness of the orzo opposed to a heavier pasta or rice. I cannot rate this dish, since I haven’t yet made it, but what a lovely & delicious-sounding dish it is, and it’s so very easy to prepare! The only ingredient which I need in order to make this dish is Orzo, so I’ll buy some tomorrow when I do my grocery shopping. I checked out some other recipes on your blog and I liked them, so I’m signing-up to receive your recipes in my in-box. “One-Pot Meals”‘ seem to be very popular lately, and I truly love them! In most cases, all you’d need to serve with them would be a nice Green Salad, and perhaps some Garlic Bread or Biscuits. Everyone is busy nowadays, so ‘one-dish meals’ really rock! My new “Chicken Fryer Skillet” (a deep frying pan) is getting quite a work-out lately! Oh I love comments like this! So now…that you are all into LaughingSpatula and stuff 🙂 Try the Italian Chicken Bake and the Southwest Chicken bake…both really easy and family friendly!